[00:02:40] <JT-Shop> you got a link to that file? [00:19:23] <RyanS> ok because I had a look at a tormach 1100 & the guy was using bob-cad , "not because it's good but because it's cheap"
[00:21:38] <RyanS> is CAM integrated into Solidworks et cetera less of a hassle than exporting STL into a separate CAM app? [00:23:04] <JT-Shop> are you trying to do 3-d stuff? [00:31:18] <PetefromTn_> CNCsimulatorpro does that reasonably well..
[00:33:32] <PetefromTn_> actually many of the nicer cam programs do that natively. [00:41:03] <PetefromTn_> Before that i used Sheetcam trial and then bought Sheetcam. [00:41:35] <PetefromTn_> CamBam allows you something like 40 saves before you are done. [00:41:57] <PetefromTn_> Some programs will limit the number of G=code lines output in trial mode. [00:42:44] <PetefromTn_> No apparently most will allow you to do the toolpath work and simulate all you want but limit code output. [00:44:37] <PetefromTn_> yeah it is tedious to get it setup but it works okay. You have to run it like a real CNC machine loading tools and offsets before it will run. [00:44:51] <PetefromTn_> In that it is a relatively accurate simulation program. [00:47:48] <Connor_iPad> os1r1s: You had a picture of a touch probe the other day. Was that yours? If so, you make it or buy it? [00:48:49] <RyanS> "Solidcam is the de-facto standard" that's reassuring. Rephrased it could to say "Solidcam is not the standard"
[00:49:13] <PetefromTn_> sorry no experience with solidcam..
[00:53:26] <PetefromTn_> Is this for hobby or pro use? [00:53:33] <zeeshan> anyone know how people typically mount their pci cards when you mount a motherboard in a control box? [00:56:07] <PetefromTn_> Well don't know your budget but for HOBBY stuff and including 3d machining it would be hard to beat CamBam... It is still in beta tho and has some quirks. [00:56:35] <RyanS> I just don't know whether to go separate Cam software or integrated into CAD..
[00:56:44] <PetefromTn_> Zeeshan. I just fabbed up a bracket to hold it vertical to keep it from flexing. [00:57:01] <PetefromTn_> hang on let me look. [01:09:24] <PetefromTn_> RyanS Honestly I am not that good with 3d parts and I am just learning to use and work with them. [01:09:46] <PetefromTn_> So I cannot comment intelligently about the way they work in CamBam. [01:10:31] <PetefromTn_> I can say that I often have to go back and forth to Cad to redo the drawing to arrive at something I am comfortable with to machine and I would expect the same if not more from 3d files. [01:14:12] <PetefromTn_> Sure man for what it is worth. [01:18:24] <PetefromTn_> RyanS I use sheetcam for simple 2.5d stuff and it has a utility that when you change something in the cad drawing that is open in sheetcam it will request of you to update to the latest drawing. Once it does that it will try to apply the same toolpaths to it but it gives you warnings if it will not work. [01:18:41] <PetefromTn_> Not sure if that is possible or not in some of the more complex 3d programs. I am sure on some level it is. [02:53:37] <skunkworks> timholum: are you in WI? [02:56:56] <jdh> got a mounting plate? [02:57:53] <PetefromTn_> One nice thing about the Cincinatti is that when I gutted the front pendant housing I was able to fit basically everything for the new control inside it easily. [02:59:26] <jdh> does it have holes/studs for a plate? [03:03:17] <Connor> Clip them on the outside flush and heat shrink leaving little stubbies. 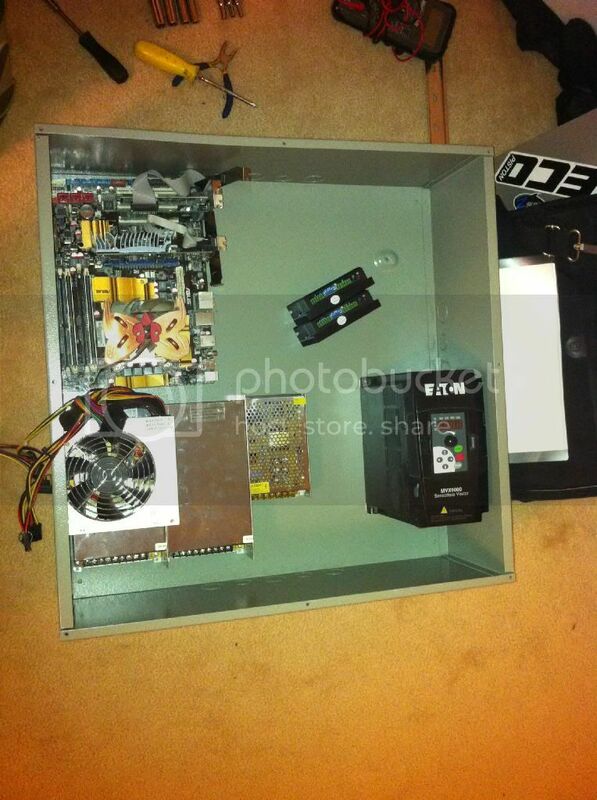 [03:04:13] <Connor> zeeshan: and I would caution placing the VFD inside the same enclosure as the BOB and PC. [03:04:24] <Connor> They can generate a heck of allot of EMF. [03:06:20] <jdh> easier to avoid a problem than remediate. [03:10:50] <zeeshan> they're going to be on opposite ends! [03:16:01] <PetefromTn_> Well managed to get the damn .dXF export and import to work in my windoze version of Freecad. [03:16:11] <PetefromTn_> Just had to revert back to the old version LOL..
[03:16:30] <humble_sea_bass> Pete, can you have them installed concurrently? [03:18:19] <PetefromTn_> yeah that is what I am doing. Sux because the new version is really pretty nice and I am getting the hang of it now. [03:18:50] <PetefromTn_> I just need to do a lot of .dxf export to setup machining ops for the simpler 2d stuff but I really want to draw my parts in 3d. [03:19:08] <PetefromTn_> Now that I understand it a bit better it sure is nice to do it that way. [03:19:25] <os1r1s> Connor: Which probe? [03:19:38] <Connor_iPad> os1r1s: Not sure. Was black. [03:20:42] <Connor_iPad> How much and where from ? [03:22:27] <Connor_iPad> What's the diff between active and passive. I saw you say something about it. [03:24:02] <PetefromTn_> Freecad is parametric..
[03:24:56] <PetefromTn_> I honestly don't think that is fair to say that. [03:25:15] <PetefromTn_> I have used solidworks and alibre and it is easier than either to learn on. [03:25:52] <PetefromTn_> It has some quirks to be sure but it is in beta still and a lONG ways from a completed program. Yet I still was able to draw several cool complex features in it. [03:46:11] <PetefromTn_> LOVE chocolate cookies. [03:46:56] <PetefromTn_> Connor That probe how do you center it? It does not appear to have any adjustment screws in it? [03:48:11] <Connor> PetefromTn_: Not sure..
[03:51:50] <PetefromTn_> what kind is that? [03:52:50] <skunkworks> trying to think of the name..
[03:53:49] <Connor> that one on ebay.. 1/4 shank.. Yuck. [03:54:08] <Connor> if 3/4 I could use with TTS without a tool holder..
[03:54:46] <Connor> That's just a touch plate..
[03:55:26] <jdh> just amusingly cheap. [03:58:10] <PetefromTn_> what a piece of crap. [10:12:36] <kengu> ideas of minimum required ram to run linuxcnc? [10:12:38] <kengu> "To allow for both EMC and its host Ubuntu Linux installation to coexist comfortably, you should have at least 256MB of RAM, though 512MB is preferable. [The remainder of this paragraph is current as of late-May 2008]"
[12:05:52] <Jymmm> Time changes Sunday, ahead one hour. [12:16:14] <kengu> hum.. my linuxcnclive-usb does boot into some "tiny micro core linux"
[12:18:57] <jthornton> you lost it? [12:20:14] <jthornton> does your spindle support orient? what kind of drive? 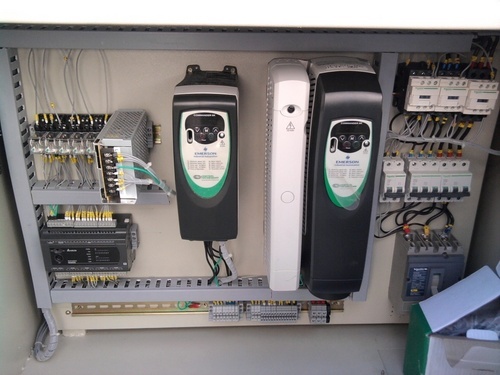 [12:21:21] <jthornton> is your spindle a servo motor or a vfd? [12:24:25] <CHNCguy> that just uses the encoder feeback right? 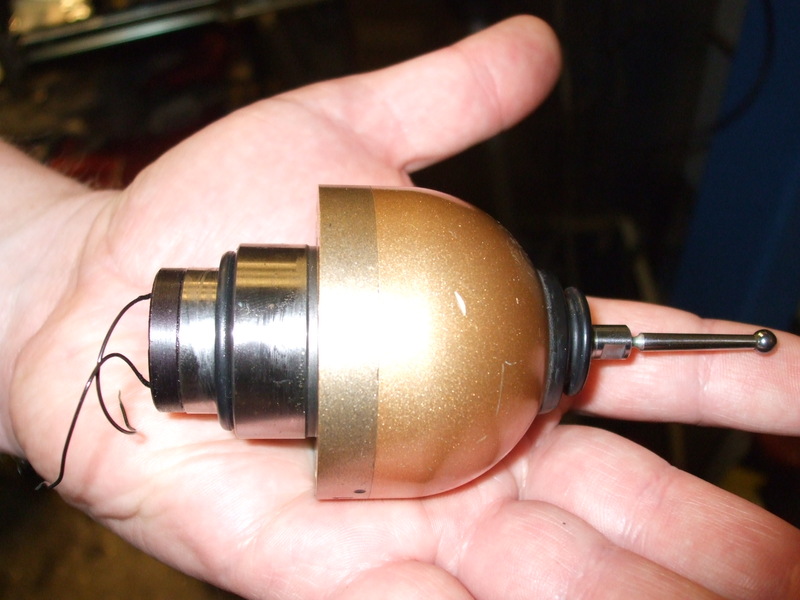 The encoder from the spindle? [13:24:24] <PetefromTn_> that looks kinda funky. Why is it so narrow? And I presume there will be a routing surface above that leadscrew along the long axis? [13:32:44] <PetefromTn_> Well I was having problems with the .dxf import/export in Freecad last night. [13:32:55] <PetefromTn_> Got pretty frustrated with trying to make it work. [13:32:55] <skunkworks> and today it works? [13:33:17] <PetefromTn_> Apparently there was some files that were omitted in the latest release under windows. [13:33:58] <PetefromTn_> But they showed me how to insert the files and how to create the .dxf views and it works beautiful now..
[13:34:02] <PetefromTn_> I am very pleased. [13:34:18] <PetefromTn_> Also the newest version of freecad has a BUNCH of neat new features to it. [13:34:34] <PetefromTn_> I was playing with it last night and it is really getting sweet. [13:35:01] <PetefromTn_> there is a measure feature that did not work before and now it has it's own toolbar with several options on it. [13:35:22] <PetefromTn_> You can dimension easily in 3d space and quickly remove the dims. [13:35:26] <skunkworks> have you heard how the cam is coming? [13:35:57] <PetefromTn_> Also generating a blueprint is super easy now with a drawing workbencht that is much improved. [13:36:15] <PetefromTn_> Apparently they are working on it steadily but they admit it is a ways off. [13:36:27] <PetefromTn_> Right now I am using CamBam and it seems to do everything I need. [13:36:45] <PetefromTn_> There are also a bunch of new plugins for cambam I downloaded and added yesterday. [13:37:03] <PetefromTn_> So far this combo is the best I have seen for very little money. [13:38:49] <PetefromTn_> So initially what I wanted was to be able to accept 3d files from customers, work with them, create my own 3d files, machine from 3d parts, or alternatively create 2d .dxf files from the 3d parts and be able to machine in 2.5d on those drawings and that is exactly where I am right now. [13:39:22] <PetefromTn_> danielfalk is VERY helpful and knowledgeable about freecad. [13:40:29] <PetefromTn_> It is quite amazing how far it has come in a short time relatively speaking. It has a ways to go but it is already a working program that is easy to use to create 3d models. [13:40:55] <PetefromTn_> You should see some of the renderings people have done with it too. Pretty damn slick. I have not played with the rendering features yet but I plan to. [13:43:41] <PetefromTn_> They are also working steadily on the assembly module and have shown videos of it working in branch recently. that is gonna be sweet to have. [13:44:32] <PetefromTn_> yup. Like I said it may not be solidworks but it is probably the next best thing. [13:45:07] <PetefromTn_> I imported the .dxf files this morning I created in Freecad into Draftsight just to check them out and they dimension perfectly and look correct. [13:45:43] <PetefromTn_> I did notice that one of my champfers I created in freecad was arc'd the wrong way in draftsight but it was easy to fix. [13:46:59] <PetefromTn_> The more I play with it the more impressed I am with it. Keep in mind this is coming from someone who has little 3d experience but has played quite a bit with Alibre design and Solidworks when I worked in that shop for awhile. [14:01:15] <Lathe_newbie> just a little question, is a motor with 16Ncm strong enough for driving a axis with a 16x4 trapezoidal spindle? [14:04:21] <PetefromTn_> when in doubt.....MORE POWER!! [14:07:13] <PetefromTn_> that is apparently only 22.7 oz in. Pretty lightweight motor. I don't know and honestly there are others here that are more into the small hobby type machines that might be better able to answer your question. [15:59:22] <CaptHindsight> http://www.youtube.com/watch?v=Qll4LYtealc I wonder how well it could handle cutting aluminum? [16:00:49] <skunkworks> high speed spindle/cuts low doc - probably pretty well... looks pretty stout..
[16:03:50] <Connor> os1r1s: Those performancemotion probes, how do you calibrate them? I don't see any set screws in the bottom or on the sides ?? [17:04:56] <humble_sea_bass> is CUBIE BETTER AT REALTIME? [17:14:45] <CaptHindsight> have you run the livecd on the e350n? [17:30:52] <CaptHindsight> humble_sea_bass: aren't there lots of OCR text/speech/braille devices? [17:34:02] <CaptHindsight> humble_sea_bass: how many dots does a reader need and how fast do they need to update? [17:41:19] <CaptHindsight> humble_sea_bass: is it a lever/cantilever design with piezo? [18:03:24] <CaptHindsight> does IRC count as a public enough posting to keep it from being patented? [18:34:39] <CaptHindsight> humble_sea_bass: there's your homework, whats the CTE of the coils? [18:36:31] <PetefromTn_> Hey guys whazzup? [18:37:18] <PetefromTn_> We talking Glorified Glue Guns here again? [18:37:58] <PetefromTn_> You mean like AHNOLD SCHWARZENEGGER!! [18:38:11] <CaptHindsight> get to the chopper! [18:38:39] <PetefromTn_> what is a coiled nylon muscle? [18:38:52] <PetefromTn_> like a nylon spring? [18:40:25] <PetefromTn_> It almost looks like it is alive..
[18:40:30] <PetefromTn_> like a real muscle. [18:41:40] <PetefromTn_> so it is electricity generating heat buildup or are they applying heat some other way? [18:42:51] <PetefromTn_> that is a new one on me man. I can see it would have a lot of varying uses. I wonder what the life of the material is in cycles. [18:45:10] <PetefromTn_> I would think a web like the first video could be created rather large and used to lift some serious weight in certain applications..
[18:47:24] <PetefromTn_> Turn that into a muscle and you would be able to do some serious lifting or pulling. Interesting never seen that before. [18:58:12] <PetefromTn_> IchGuckLive Today is actually quite comfortable in mid 50's and nice and sunny! [19:00:18] <PetefromTn_> I wonder what the prospect are for human muscle replacement and rejection with this kind of materials. They kinda hinted at that in one or two of the videos. [20:05:07] <hetii> Q: I consider to order CNC 3020 that will use for making circuit PCB. As far as i see its require to have PC with true LPT port. Is it possible to use this board http://www.knjn.com/FPGA-Parallel.html then based on this project http://reprap.org/wiki/Arduino_GCode_Interpreter implement on it G code interpreter? [20:07:42] <hetii> or maybe its already some board that can act as a bridge between linuxcnc and such machine, for example via ethernet ? [20:13:35] <cradek> hetii: the things you are asking don't make any sense. That Pluto plugs into a parallel port; it is not a substitute for one. 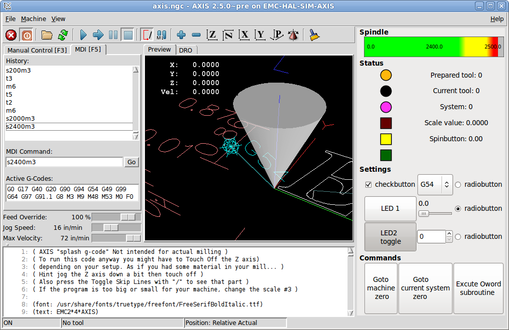 Linuxcnc and Arduinos don't go together really in any way. [20:14:47] <cradek> Nick___: could you explain what you mean by surface coordinates, so I am sure what you're asking about? [20:17:37] <cradek> you don't have any text there at all? [20:18:34] <cradek> did you do anything special about video card drivers on this install? [20:19:06] <cradek> what version of linuxcnc is this and what os? [20:19:52] <Nick___> now that you mention it, I do get some glitches on the output whenever I try to move the window. I havent installed any drivers for the video card so far. [20:20:16] <cradek> what kind of video card is it? might just want to swap it for a different one. [20:25:05] <skunkworks> Nick___, is this for running real hardware? [20:27:08] <skunkworks> how is it with latency? [20:30:07] <PetefromTn_> LOL exactly right..
[20:30:18] <PetefromTn_> What kinda machine is it running? [20:32:21] <Nick___> yeah, thats quite a problem indeed, read about it too late. The latency test is showing a jitter of nearly 200.000ns but the cnc control seems to work pretty well so far. So far I haven't seen much of a negative effect. [20:44:21] <CaptHindsight> http://cgi.ebay.com/ws/eBayISAPI.dll?ViewItem&item=291072922333 "the machine is complete, with chiller, etc. it does NOT include the vises, tool holder and tools that you may see in the photo"
[20:45:26] <hetii> cradek: Well, i hate windows and don`t plan to use Mach 3 at all so thats why I just wondering if its possible to design a hardware that will control CNC 3020 without using LPT. I really curios why its still used for CNC machines. [20:46:55] <hetii> Yes i know but for eg when you have modern laptop/pc etc its still odd for me. [20:50:37] <skunkworks> there are some ethernet solutions - but they are beta..
[20:50:59] <CaptHindsight> PCW: what's the status of GBethernet driver and boards? [20:51:04] <hetii> ok then where i can read about them ? [20:55:16] <CaptHindsight> hetii: what hardware are you considering designing? [20:58:00] <hetii> That be able to control CNC machines that require LPT port, The pluto board looks very promising in this case, because in one side you have LPT port (can work as any other one) and in another side you have enough pinouts for custom machnies. [20:59:25] <hetii> so basically maybe its a worth to design a PCB board that will cover most scenario for cnc like 3020 or even home made. [21:00:13] <hetii> With FPGA capabilites it should be possible. [21:01:07] <CaptHindsight> http://www.mesanet.com/fpgacardinfo.html like the 7i43 for instance? [21:03:52] <CaptHindsight> hetii: what would you do differently on your board? [21:07:13] <hetii> cradek: I just consider to use it as a start point for board that will control directly my cnc machine. So at the end of the they it could be connected directly into my cnc instead PC. [21:09:21] <hetii> CaptHindsight: I just do a research about possibilities, for eg. i don`t see before the MESA 7I80DB board, thats why I need read more about them. [21:41:57] <CHNCguy> hey JT u in buddy? [21:42:14] <CHNCguy> JT-shop, is your discovery cat 30 or 40? [21:43:42] <CHNCguy> hey rob, can you share how you got your tool changer to work on your vmc? [21:44:18] <rob_h> well i think better question is, what do you want to know? [21:44:43] <CHNCguy> did it index with a servo? [21:45:51] <JT-Shop> that the drive with orient built in? [22:24:11] <PetefromTn_> tom_R2E3 Hey man whatsup? [22:33:12] <PetefromTn_> Oh sorry man I thought you were the same guy with the hitachi seiki VMC he was retrofitting. [22:36:08] <JT-Shop> what driver are you using? [22:37:18] <Nick___> is there perhaps a database with preprogrammed AXIS extensions out there? [22:38:35] <JT-Shop> Nick___, can you describe what you mean? [22:42:04] <Einar_> Mine is an Acer B226HQL. It was cheap, but I don't mind as long as it works. Recommended, except it seems to be capacitive. I would prefer one that needs a firm touch. [23:14:09] <Nick___> Thank you, JT-Shop. I found the DRO-Tab but switching between that and the graphical output becomes tedious... I'll look into this PyVCP coding. Is there a comprehensive HAL pin list somewhere? [23:20:41] <Nick___> Very nice,Thank you for your help! [23:44:26] <somenewguy_batu> so who has an extra 48v power supply they wanna send me?